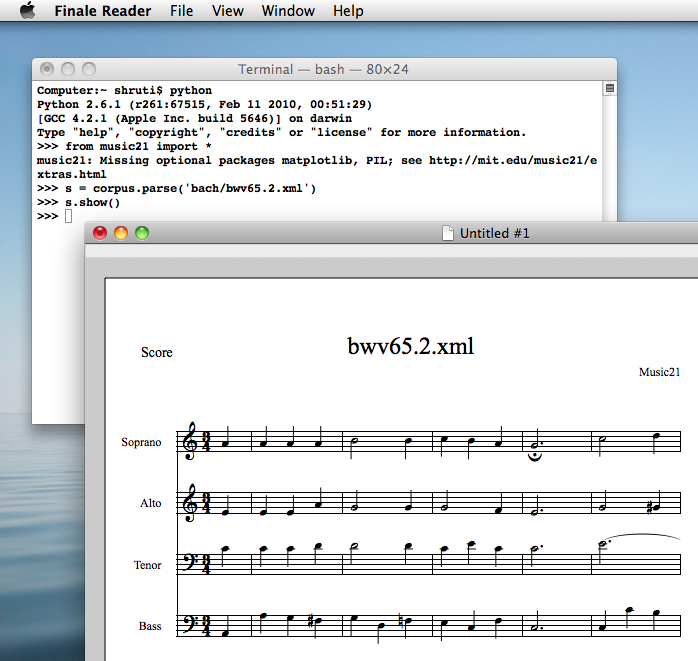 If you’re going to use music21, you’ll need to have a copy of it and Python on your computer. The instructions are slightly different for each type of computer, so follow the link below and then come back to the system. For many people, installation is the most difficult step for a bit. When a new version of music21 is released, you can upgrade by using the same method that you originally used to install it. If you want to see if it’s worth installing, keep reading the guide without installing, but if you have installed already, you’ll get more out of the guide since you’ll be able to follow along. We’ll just see if music21 worked for you. Open up the Terminal (Mac) or IDLE (Windows). On the Mac type “python” (without the quotes) and hit enter. You’ll probably get a few warnings that you’re missing some optional modules. That’s okay. If you get a warning that “no module named music21” then something probably went wrong above. Try going step-by-step through the instructions above one more time, making sure not to skip anything. 99% of installation errors come from skipping a step above. If you still have a problem, Google for “installation problem music21” or “installation problem mac python module” and see if anything looks familiar. If all else fails, contact the music21list Google Group which might be able to help. On your site you should see something like this. Again, if you don’t have MusicXML working for you yet, don’t panic, we’ll give more explicit instructions in a few chapters. For now, let’s proceed to Chapter 2: Notes.